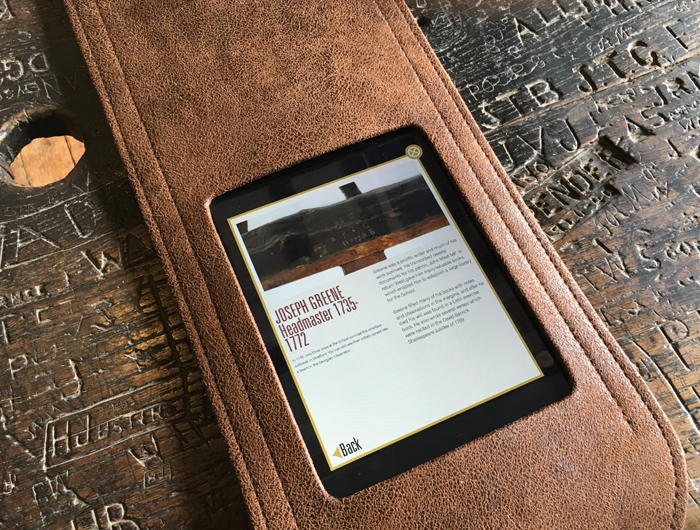 A turnkey service including software development, hardware specification, our content management system, installation on site and handbook for Shakespeare’s Schoolroom and Guildhall. In the year of the 400th anniversary of the death of William Shakespeare, it has been particularly interesting to work with Imagemakers on the exhibits that interpret a “missing chapter” in the playwright’s history – Stratford’s Guildhall where Shakespeare attended school and probably saw professional theatre for the first time. Of international significance, this 15th-century building is one of the finest surviving medieval guildhalls in Britain. It served originally as the headquarters of the Guild of the Holy Cross. From 1553 it was the headquarters of Stratford Borough Council, as well as a civil court and the town armoury. As well as its close associations with the Shakespeare family, the Guildhall is distinguished by its rare 15th- and 16th-century wall paintings. Because of the historic nature of the building and the artefacts within it – particularly the school table dating back to the 18th century with its collection of initials carved by old boys of King Edward VI School over the years – it was important that the exhibits were both sympathetic to the nature of the building and had minimal impact on its structure. 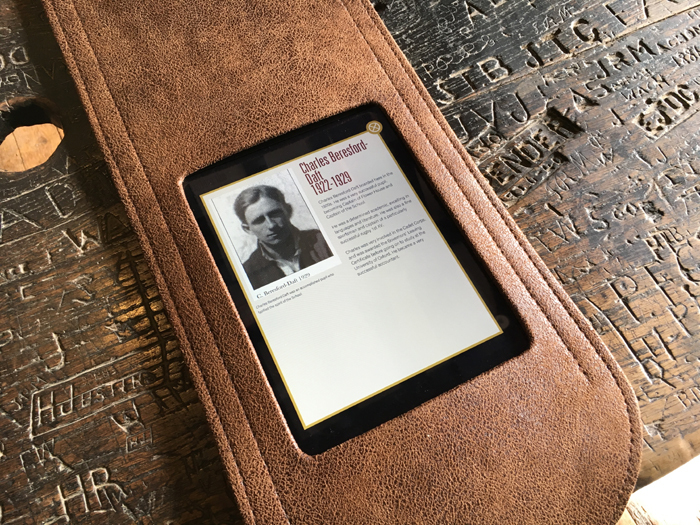 Four tablets are secured to the school table with specially commissioned, hand crafted leather straps, designed to be sympathetic to the setting and reflect the quality of craftsmanship within the room. Lightweight Android tablets keep the infrastructure light to minimise impact on the table. Each tablet slips securely into a strap and the cables are kept tidy and safe on the underside of the table. 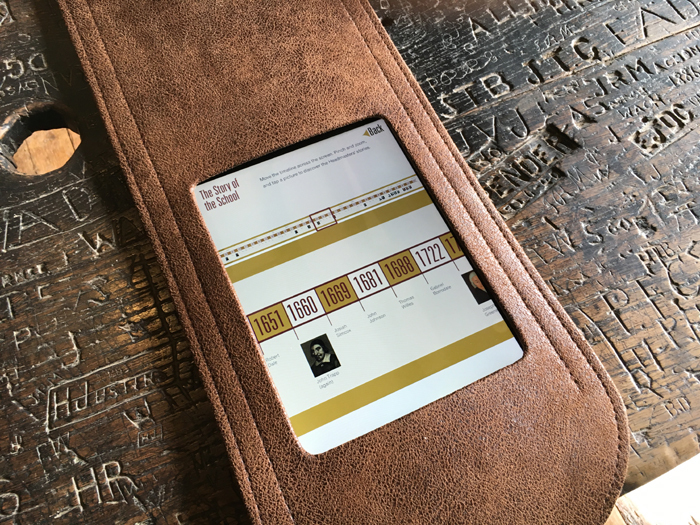 The straps can be easily moved or removed with no direct impact on the table, and the leather is stiffened in order to keep the tablets safe and secure. 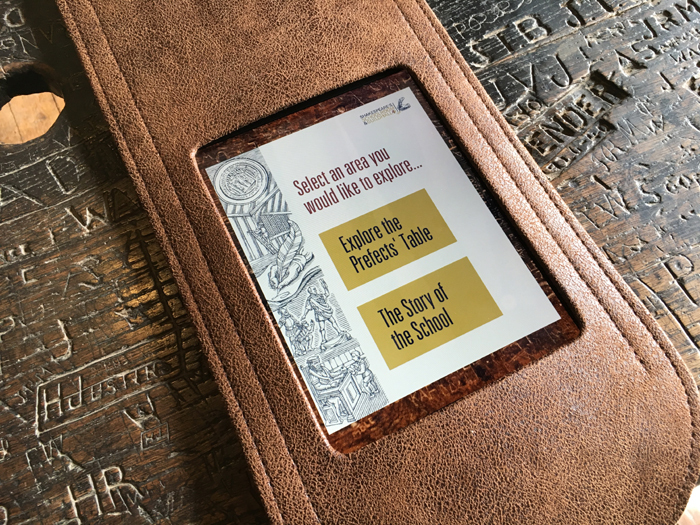 Exploration of the Prefects’ Table gives visitors the chance to zoom in and out on the graffiti and to click on hot spots which lead to interpretive content about the life of an “old boy” behind a particular set of initials. Alternatively, visitors can explore a timeline of the School’s history with a focus on the headmasters who have led the School. 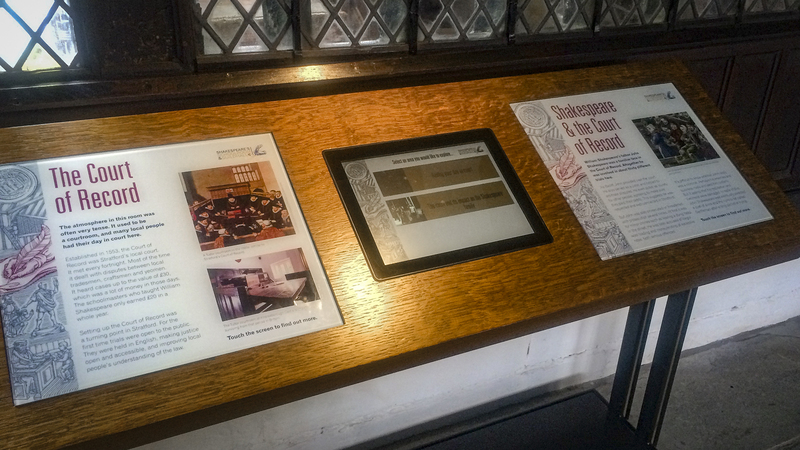 Four lecterns house touchscreens that display content around four themes: Welcome to the Guildhall, The Guild of the Holy Cross, Stratford’s Borough Council, and The Court of the Record. We liaised with the joiners to ensure that the free-standing lecterns would accommodate the specified small form hardware that the exhibits are in keeping with the style of the room, having minimum impact on the building. 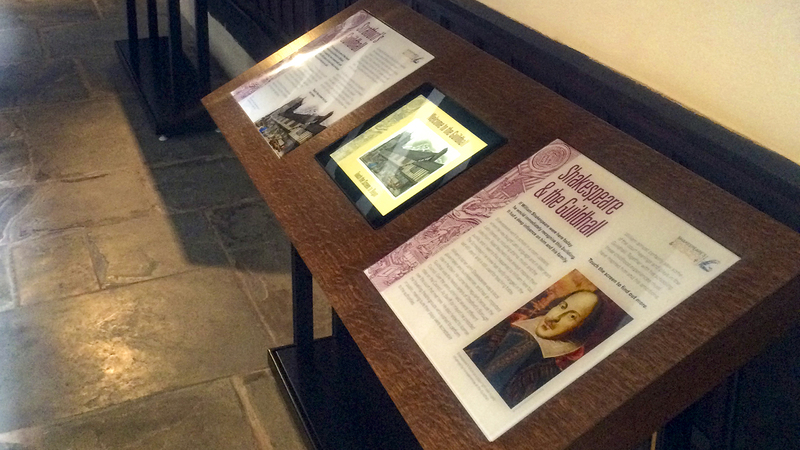 The touchscreen exhibits allow visitors to explore the history of the Guildhall, from its construction, to the roles held in the Court of Record. Indeed, William Shakespeare’s father, John, was a familiar face in the Guildhall, serving on the Borough Council and often appearing in the Court of Record. These exhibits are also powered by our content management system, allowing flexible updating of the source material.